The Gypsy river cruiser sails the majestic Mekong River between the UNESCO World Heritage city of Luang Prabang and Thailand’s Golden Triangle. This exclusive two-cabin luxury boat can accommodate up to four passengers comfortably, with no expense spared on plush sleeping cabins with an en-suite shower and vanity. There's also a communal mid-ship lounge, a bar and dining area and a veranda-style lounge with an al fresco panorama deck to soak in the beauty of river’s surroundings with a glass of champagne and gourmet meal at day’s end. A voyage along the Nile is a treasure in its own right—throw in a seven-night cruise on the Oberai Zahra and you’ve got a floating paradise overlooking approximately 5,000 years of Egyptian culture and heritage. Enjoy a one-of-a-kind river experience discovering ancient Egyptian monuments and historic landmarks while relaxing in the privacy of your luxury suite. The library and cigar lounge are also ideal places to wind down and tune in to the surroundings. You can also hit the Oberai Spa, the fitness centre or the temperature-controlled swimming pool on the outer deck. When the delights and sights of Champagne call to you, try Belmond’s new luxury barge, Pivoine. The latest addition to the Belmond Afloat In France fleet, its dreamy interiors take inspiration from the vibrant summer colours along the Champagne waterway, evoking images of rural France. Pivoine can carry up to eight passengers in its four spacious cabins, sailing from La Ferte-Sous-Jouarre to Châlons-en-Champagne with the promise of visits to chateaux, peaceful vineyards and riverside villages along the way. Traverse the azure blue waves of the iconic Danube river with The Crystal Mozart, an award-winning ship that’s been nicknamed the "Queen of the Danube". This spacious river ship features 77 roomy suites, a full wrap-around promenade deck, the first pop-up bar in river cruising and butler service. The views on this dreamy cruiser are unspeakably beautiful on the voyage from Vienna to Budapest and back by way of the verdant Wachau Valley. Asia’s largest river is bound to impress the eager traveller. Depending on your itinerary choice, the cruise starts in either Chongqing or Yichang and pass through the awe-inspiring Three Gorges region, a marvel of engineering prowess and natural beauty. The Yangzi Explorer accommodates up to 124 passengers with 38 deluxe cabins, 20 suites and four specialty suites. There’s lots to keep you occupied on-board, including tai chi sessions on the explorer deck in the morning, live entertainment at the duplex theatre, a spa and other pampering amenities. There’s no shortage of resplendent vistas and exciting things to do in the Douro River Valley, a UNESCO heritage site and the world’s oldest demarcated wine region. Get yourself on-board a Viking Cruises vessel from Lisbon to Porto and experience incredible Manueline architecture, traditional cuisine, wine tastings, fado dancing with the locals on a 10-day Portugal’s River of Gold cruise tour, inclusive of a hotel stay in Lisbon and a visit to Salamanca in Spain. Aqua Expeditions introduced the Aria Amazon in 2011, giving the 16-cabin luxury cruiser a generous facelift in 2015. 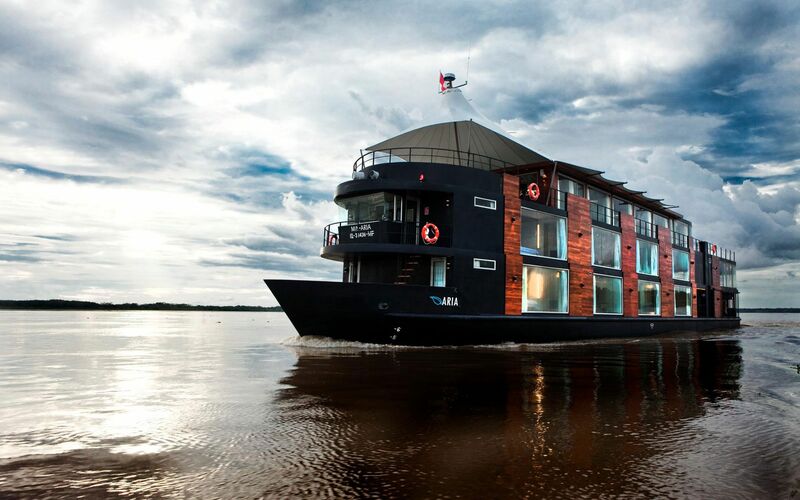 The Aria Amazon river cruise itineraries cover three, four or seven nights aboard the luxurious vessel as it sails over the waters of the Peruvian Amazon. When you’re not lounging in your stately suite, you can hit the jacuzzi on the observation deck and catch a glimpse at rare species of wildlife including pink dolphins, manatee, taricaya turtles and exotic Peruvian birds.